It’s my birthday week! Giving a little something back while I celebrate. 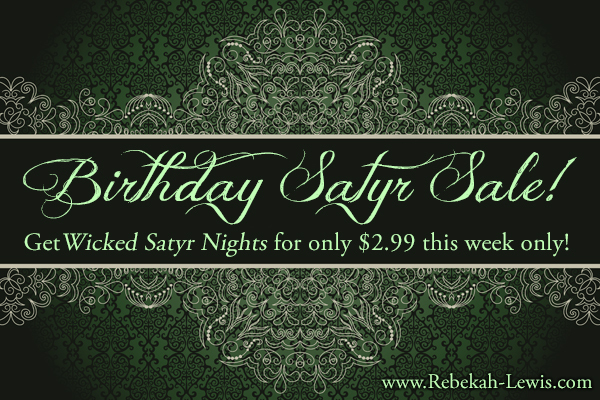 Now through next Sunday, grab a copy of the first full-length novel in The Cursed Satyroi series, Wicked Satyr Nights, for only $2.99. This sale is only available on Amazon and All Romance. Keep in mind you can still read Wicked Satyr Nights, Midnight at the Satyr Inn, and Under the Satyr Moon for FREE in Kindle Unlimited in The Cursed Satyroi Volume 1 collection. Now is the perfect time to start a new series or tell your friends to take the plunge.